How long will Barry safeguard Central City? Has The Flash TV show been cancelled or renewed for a fifth season on The CW? The television vulture is watching all the latest cancellation and renewal news, so this page is the place to track the status of The Flash, season five. Bookmark it, or subscribe for the latest updates. Remember, the television vulture is watching your shows. Are you? Airing on The CW television network, The Flash stars Grant Gustin, Candice Patton, Danielle Panabaker, Carlos Valdes, Tom Cavanagh, Jesse L. Martin, and Keiynan Lonsdale. The CW TV series centers on police scientist Barry Allen (Gustin) who develops super speed after a dark-matter lightning strike. Behind his mask, Barry uses his powers to protect the people of Central City from many a dark force. The fourth season of The Flash averaged a 0.80 rating in the 18-49 demographic and 2.21 million viewers. Compared to season three, that’s down by 25% in the demo and down by 22% in viewership. Find out how The Flash stacks up against other CW TV shows. The Flash has been renewed for a fifth season which will debut October 9, 2018. Stay tuned for further updates. Season four of The Flash premiered pretty well. Though the show’s ratings have come down, the scarlet speedster’s TV series remains a very popular program for The CW. I’m sure that it will be renewed for a fifth season. Subscribe for free updates on any cancellation or renewal news about The Flash. 4/2/18 update: The CW has ordered a fifth season of The Flash for the 2018-19 season. Details here. TV show ratings are still important. Follow The Flash‘s weekly ups and downs. Check the rankings for all of The CW’s current TV shows. Find more of The Flash TV series news or other CW TV show news. What do you think? 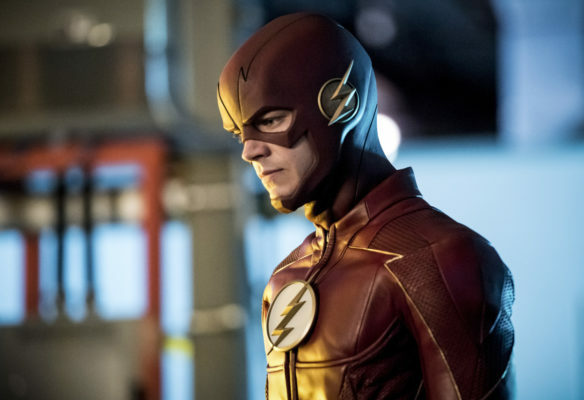 Are you glad that The Flash TV show has been renewed for a fifth season? How would you feel if The CW had cancelled this TV series, instead? DC’s Legends of Tomorrow: Cancelled or Renewed for Season Four on The CW? PLEASE renew for season 5 i really do love this show so very much. I would truly be sad and disappointed if it were to be cancelled. Besides can’t leave something unfinished or leave it at a cliffhanger. PLEASE let there be a season 5 they cannot leave it at a cliffhanger and i love this show so very much. And i would be quite sad and disappointed if it ended. Please renew!!! i hope the the flash get renewed for another season i hope the flash will keep on going all fore means years to come i would like if there where to be 11 12 13 14 more season of the flash and it would be nice if some got to play the role of green lantern and if they did something like that then it could led to a spin off i keep hoping they will do something like that.. The Flash doesn’t disappoint its DC audience and it continues to satisfy the viewer and leave them at the edge of their respective seats week in and week out. Renew The Flash for a fifth season, please. I never watch TV…..NEVER. My grandchildren got me to watching Flash and I LOVE it! PLEASE BRING FLASH BACK FOR SEASON 5! End it it’s the most pathetic show ever to be created. It’s the worst in the arrowverse and their ratings would be a lot more if the flash leaves. Everyone I know wants to see the flash die. Seriously Grant Gustin and everyone else in that show is wasting their time.